Joel Rivera is in, Helen Foster is out in the race for Bronx BP, as Assemblyman Ruben Diaz, Jr., continues to pick up endorsements. Helen Foster and Bronx Democratic Chair Carl Heastie, along with other Bronx and Brooklyn politicians are up in arms over the elevation of a white, Queens-based nominee to the position of city clerk. A Bronx mailman has been arrested for his role in a $40 million scam based on fraudulent tax rebates. Doctors at the Jacobi Medical Center performed surgery on an Afghan girl whose journey to the Bronx began when an American contractor met her in an orphanage in Afghanistan. Police have arrested a second Bronx man accused of the hate-crime killing of an Ecuadorean immigrant. Labels: Borough President, Carl Heastie, Helen Foster, Jacobi Medical Center, Joel Rivera, Police, ruben diaz jr.
With a special report on the largest food distribution center in the world--the three Hunts Point markets--the March issue of The Hunts Point Express has hit the streets. and new scholarships that could provide up to $50,000 to eight college-bound high school students. A security guard in the Bronx wins 1 million dollars from a scratch off ticket. More details are being released about the Parkchester grandmother, Angela Barksdale, who killed her four-year-old grandson. The boy and his 18-month old sister lived with Barksdale on Metropolitan Avenue. Police have confirmed that Barksdale had a criminal record and was a convicted felon. The Administration for Children's Services was not responsible for placing the children in Barksdale's home and have removed the sister. Details can be found here and here. 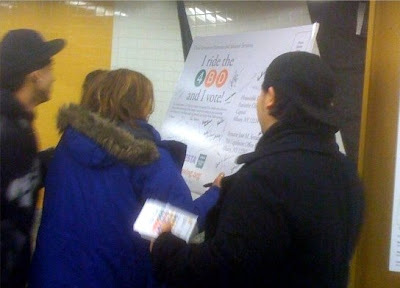 There are going to be more MTA service changes and subway delays. The MTA is attributing the changes to repairs that need to be made. While a study finds that New York City is the most congested city in the country, the Cross Bronx Expressway at the interchange of Bronx River Parkway was named the worst bottleneck in the nation. Majora Carter, community activist and the founder of Sustaintable South Bronx, appeared in a commercial during the Academy Awards ceremony on Sunday. The commercial was sponsored by the company True North. Pay-as-you-go restrooms, that clean themselves after use, are coming to a street near you (if you live in Riverdale or Morris Park). Helen Foster is staying out of the borough president's race, says Daily News columnist Bob Kappstatter. Instead, with the support of the party, she'll run for a third City Council term (District 16). More here on her likely opponents. If the BP's race sees Assemblyman Ruben Diaz Jr. square off against Councilman Joel Rivera, Kappstatter expects them to run "a rather gloves-on contest." (The two are, or were, good friends.) Fordham University's Prof. Bruce Berg, on the other hand, predicts a hard fought and potentially ugly campaign. A teenager was shot and killed yesterday on Gerard Avenue near East 168th Street. State Senator Jeff Klein and the Working Families Party have fallen out over the so-called millionaire's tax. The Botanical Garden's annual orchid show opens this Saturday. The Ghetto Film School in Mott Haven was featured on NPR this week. You can listen here. Labels: Botanical Garden, Helen Foster, Jeff Klein, Joel Rivera, ruben diaz jr.
Tonight, after those of you with cable tune into to BronxTalk, move the digital dial over to 13.1 for History Detectives. The PBS show will, among other things, investigate the birth of hip hop at 1520 Sedgwick Ave. Traditional investigative techniques, modern technologies, and plenty of legwork are the tools the History Detectives team of experts uses to give new - and sometimes shocking - insights into our national history. A hip hop enthusiast from New York City has always heard that 1520 Sedgwick Avenue in the Bronx is the birthplace of hip hop. This, the contributor believes, marked the birth of hip hop. The music led to an entire cultural movement that’s altered generational thinking – from politics and race to art and language. History Detectives sets out to examine an inner city environment that helped lay the foundation for a cultural revolution. More on 1520 Sedgwick here. Also, check out Manny Fernandez's piece in the Sunday Times about illegally partitioned apartments in the Bronx, Brooklyn and Queens. With the affordability crisis and the economic downturn/implosion following the burst of the housing/credit bubble, dividing up apartments and subletting rooms isn't about to go away anytime soon -- often with deadly consequences. The Bronx is the crappiest borough? Hurts to hear it, but in the way NBC means it -- the borough with the most summonses for violations of the pooper scooper law -- it's hard to argue otherwise. The areas with the most violations? Hunts Point and Mosholu Parkway. Only affirms why Mosholu Preservation Corporation, publisher of the Norwood News, started the "Cut the Crap" campaign. 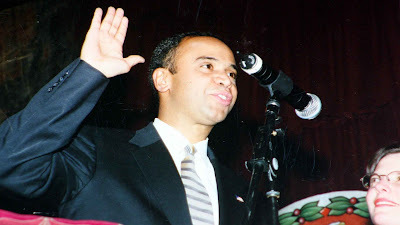 Not wasting a moment, Assemblyman Ruben Diaz picked up the endorsement of the Liberty Demoratic Club in his bid to replace Adolfo Carrion as borough president. Liz Benjamin also reports that the Bronx County Democratic Committee will support Diaz, confirming what we predicted a few weeks ago. Speaking of the younger Diaz, his father, State Senator Ruben Diaz Sr. and the Three Amigos are still strategizing Liz reports -- they had lunch recently on Kingsbridge Road and are forming a PAC called the Three Amigos PAC. Kind of a cute name but since the whole point of it is recruiting more Amigos to pony up campaign cash, seems a little shortsighted, no? Don't miss Gary Axelbank's BronxTalk show on channel 67 (Cablevision) tonight at 9 p.m. He'll be talking with Joyce Hogi and Karen Argenti of the Bronx Council on Environmental Quality about a variety of Bronx environmental issues. Call in with your questions/concerns. Gary also provides regular video commentary -- often on environmental issues -- right here on the Bronx News Network. Click here for his commentary on the filtration plant debacle and here for his views on the controversy surrounding Yankee Stadium. Departing Borough President Adolfo Carrion gave his final State of the Borough speech this morning at Lehman College. If you were looking for a preview of what he plans to do in his new job, this wasn't it. 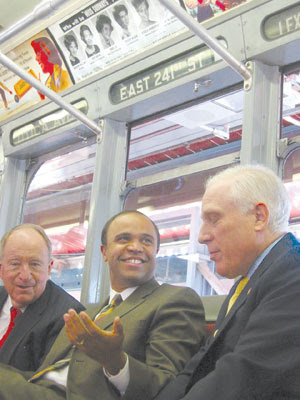 He offered a retrospective of State of the Boroughs past and took credit for the Bronx's economic development since 2002. And despite plenty of eloquent lines about the power and beauty of American cities, he didn't offer any details of what he wants to accomplish in his new role as first ever Director of the White House Office of Urban Affairs. He shed no light on the president's priorities on this front, either: all of his references to Obama were to a speech Obama gave back in the summer, before he was elected. Carrion did say, "Neglect is not a policy for America's urban areas," and added that we need "a policy looking at metropolitan areas, not just cities." "We shouldn't be succeeding despite Washington, we should be succeeding with a hand from Washington," he said. But no news yet on what he thinks that hand will hold. Surprise guest Sen. Charles Schumer introduced Carrion and crowed about the money New York will get from the federal stimulus bill and the advantage of having Carrion in the White House – an appointment he took some credit for. "For the first time in this stimulus package, New York gets a lot more back than we sent to Washington," he said. Pointing out that plenty of stimulus money will be distributed at the discretion of the president, he added, "And guess who will be making that decision? Our Borough President, Adolfo Carrion! When you're there, we know you won't forget the Bronx, New York City, or New York State!" We'll try to put up excerpts of Carrion's speech when we get it. On Valentine's Day morning, a man who lived in the Norwood area his entire life was shot dead while getting into his car. No arrests have been made, but the man's companion and others say the victim was embroiled in a heated dispute with his landlord. Police said the man was not robbed. Our in-depth look at Adolfo Carrion's performance as borough president, which we put on the blog last night. His 8th and final state of the borough address is tomorrow morning at 9:30 at Lehman College. Housing bills, including one that would repeal vacancy decontrol, are now in the hands of the Democratically-controlled Senate, giving hope to tenant advocates across the five boroughs and putting the spotlight on new senate housing chair Pedro Espada, Jr.
Riders and advocates made a final and passionate plea in the Bronx to stave off a slew of proposed transit cuts. Eva Bornstein has led a dramatic turnaround at the Bronx's only performing arts center. 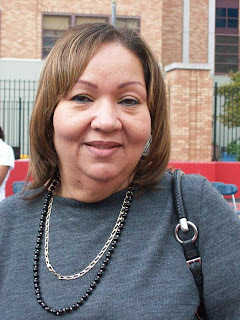 Despite failing to file financial disclosure forms, which could prevent her from receiving public financing, Council member Maria Baez says she's running for a third term in 14th District, which is now increasingly crowded with candidates. Plus, our Inquiring Photographer asks residents how the economic downturn is affecting their lives...our expanded Neighborhood Notes guide to local programs and services...and our Out&About arts and entertainment calendar. PS 226, an elementary school on Sedgwick Avenue in University Heights, is raising money to build a gymnasium. So far, the school's held several fund-raisers – including a celebrity golf tournament in Los Angeles – and pulled in about $1 million, which includes a $500,000 commitment from Bronx Council Member Maria Baez. Robert Romano, a teacher at the school who's leading the effort, has a famous brother: actor Ray Romano of "Everyone Loves Raymond" fame - hence the celebrity involvement. To help attract additional donors - they need another $2-3 million - the school recently had a video made (above). In it teachers, parents, and others (including Baez) explain how the facility, if built, will benefit the school's 450 students. A fire early this morning sent seven firefighters to the hospital. The fire department reported no serious injuries, and everyone in the building got out safely. The second jury in the Black Sunday fire trial told the judge last night that they were deadlocked after three days of deliberation. The jury is considering charges against a former and present owner of the building where two firefighters died in 2005. The judge has instructed them to continue deliberating today. Tenants in the building were acquitted by another jury earlier this week. Giorgio Armani and Caroline Kennedy were in the Bronx yesterday to visit an art center Armani funded through the Fund for Public Schools. Armani's thoughts on the subway, here. CityRoom reports on problems with The Bronx Job database bronxatwork.com, run by the Bronx Overall Economic Development Corporation. Namely: it lists no jobs. The website was set up by outgoing BP Carrion as part of his Bronx jobs initiative. It'd be nice to have it up and running, now that unemployment in the borough has hit 9.6%. More on this in the upcoming Norwood News. A Bronx Community College student and father-to-be was shot and killed in a deli yesterday while trying to break up a fight. The student, Joseph Vega, 21, and another customer, Jermaine Stewart, didn't know either of the men fighting when they tried to intervene. Stewart was also shot and is serious but stable condition. The suspected gunman has turned himself in. A Pelham Parkway woman got some financial advice, care of the Daily News. A South Bronx street was renamed after community activist Yolanda Garcia on Tuesday. And of course, as you see below, BP Carrion is heading to DC to direct a new White House Office on Urban Policy. More on all this later. On Feb. 12, over 150 protesters from the Middle School 399 community rallied a second time outside the school, located on 184th Street at Creston Avenue, in preparation for a one mile march to the Community District 10 Education Council Meeting at MS 45 to contest their school's closure. They held their first rally in December. Juan Gonzalez singles out Bronx State Senators Pedro Espada and Jeff Klein for indicating that they won’t support the millionaire’s tax or to increase the threshold vacancy decontrol rent from $2,000 to $5,000. Espada’s opinion has an impact beyond his one vote because he secured the chairmanship of the Housing Committee after he threatened to withhold his support from making Malcolm Smith the first Democratic majority leader in 40 years. Next time you’re walking down Jerome Avenue, think about the fact that it was built by Winston Churchill’s grandfather to lead to a racetrack that is now the Jerome Park Reservoir. That and more fascinating info in this Times article about how a municipal bond issued in the late 1800s to finance the street’s construction is just now coming due. Councilman Joel Rivera wrote to former Public Advocate Mark Green, who is running for that office again, to chastise him for referring in this video “letter to New Yorker” to single parents in the Bronx. Take a look for yourself. Green’s opening remarks, with the new Yankee Stadium in the background, strike me as a typical formulation for a politician – “If you’re a single parent in the Bronx, or a retiree in Queens ….” Candidates and elected officials do this all the time in speeches, not necessarily meaning that everyone in that place is that one thing. And there are indeed a lot of single parents in the Bronx as in the rest of the city. But, again, check it out. Tell us what you think. We've just learned from Enterprise Community Partners that Rafael Cestero has been named as the new Commissioner for the City's Department of Housing Preservation & Development (HPD). Cestero currently serves as the senior vice president, regional executive of the eastern region for Enterprise Community Partners, Inc., a national nonprofit that has worked extensively with local groups building and renovating affordable housing in the Bronx over the past two decades. Enterprise was recently named Fast Company magazine's Social Enterprise of the Year and you can read about it on Amazon. "New York City is fortunate to have someone with Rafael’s expertise in the housing and community development field and his passion for affordable housing to lead HPD. Enterprise looks forward to continuing its partnership with the city of New York and to work along side our longtime colleague and friend." The west Bronx will hopefully benefit as well, as Cestero has a history of working closely with a number of Bronx housing nonprofits. The New York Observer is also confirming the appointment. Update: Here is the official press release from HPD regarding the appointment. Heastie previously said that no door's closed; that he's willing to extend an olive branch to those he's fallen out with in the past. But the goodwill only goes so far - Baez was/is a close ally of former party boss Jose Rivera, whom Heastie defeated in what was a bitterly contested leadership fight late last year (and one that's still being played out in an appeals court). "They're really going to go after her [Baez]," said one source close to the party. Others hoping to topple Baez (pictured) include Fernando Cabrera, Yudelka Tapia, and another Heastie ally, Hector Ramirez (unless he's now stepped aside for Polanco). More here. The primary will be held in September; the election in November. UPDATE: I just spoke to Polanco. "I hope to get their [the party's] support when the time comes... probably in March or April," she said, but that it wasn't guaranteed. "Have I spoken to Carl and he's said yes? That hasn't happened." Polanco, a 28-year-old University Heights resident, said she recently stopped working for Palma so she can concentrate on her campaign full time. At the moment she's focused on getting the unions behind her. UPDATE 11: Patrick Jenkins, a consultant for the party and Heastie's special assistant, said his boss "isn't supporting any candidate at this moment." Jenkins said the party would look at each individual carefully (including Baez) before deciding who to endorse. Verdicts are expected tomorrow in manslaughter trials of two tenants and a landlord charged with the 2005 deaths of two firefighters at a building on East 178th Street. The prosecution claims the men died because illegal partitions inside an apartment blocked access to fire escapes, forcing six firefighters to jump from a fourth floor window (four survived). The defense says firefighter protocol was to blame. More here. New York State's highest court has a new chief judge. Jonathan Lippman was appointed yesterday after a vote in the Senate. Several senators abstained, including the Bronx's Ruben Diaz Sr. and Pedro Espada Jr., saying they didn't believe the nomination process gave women and minorities a fair shot at the job. A Jewish group has hung a "Free Palestine" banner above the entrance of the Cross Bronx Expressway. Twelve people have been arrested following a one-year investigation into a spate of vehicles thefts in the New York area. Police say the gang targeted luxury cars and construction equipment. Congressmen Elliot Engel and Joseph Crowley have sprung to the defense of the $400 million naming rights deal between the Mets and Citigroup. Nursing homes in Riverdale, and their residents, are concerned about proposed budget cuts. Labels: black sunday, Eliot Engel, Joseph Crowley, Pedro Espada Jr.
Two juries have begun deliberating in the Black Sunday fire trial. The prosecution and defense delivered closing arguments yesterday. Two people were injured in a shooting this morning in Baychester, one while waiting for the bus. Service on the 5 was suspended for two hours while police searched for the suspect on Brooklyn-bound trains. No word on whether they found him. It's not a good week for Baychester: police are also asking the public for help finding a man who tried to kidnap two women at gunpoint near East Gun Hill Road on Monday. CNN has a report on a doctor who ran a small office in the South Bronx for decades with a mission to provide medical care for the poor, and now faces losing his own home. 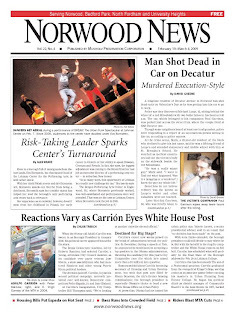 The Mercy Center of the South Bronx is featured today in the Anglo-Celt Newspaper -- of Cavan, Ireland. The Daily News reports on the ongoing ordeal of a paraplegic man handcuffed to a hospital bed and forcibly fed laxatives at Our Lady of Mercy Medical Center when he was mistaken for a drug mule - a radiologist reading an x-ray mistook gall bladder stones for condoms stuffed with drugs. Hunts Point food vendors are protesting a policy change by the Post Office, which wants to charge them a new fee for picking up mail early. We recently linked to one stink in the South Bronx. Now the Times has an article on another smelly substance being dumped in Hunts Point.